This is not a jazz gig, but Jazz.Coop was set up to promote poetry as well. 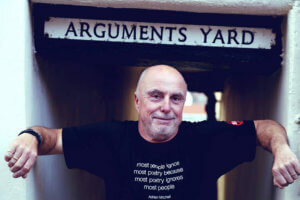 This is a rare chance to experience the radical-force-of-nature performance poet/musician Attila the Stockbroker in the intimate environment of the Globe. Launched into public consciousness by legendary Radio One DJ John Peel in 1982/83, Attila the Stockbroker has spent 35 years touring the world as a self sustaining DIY one man cottage industry, performing well over 3,000 gigs in 24 countries and releasing 40 LPs/EPs/CDs and 7 books of poetry. His autobiography ‘Arguments Yard’ is social history and personal story combined: a cultural activist’s eyewitness journey through the great political battles and movements of recent times. Rock Against Racism/Anti Nazi League/Anti-Fascist Action, Miners’ Strike, Wapping dispute, Red Wedge, Poll Tax, campaigns against two Gulf Wars: Attila has been there, done the benefit and worn the T shirt. There are memoirs from all over the UK and mainland Europe and his many tours of Australia, Canada, New Zealand and the USA, and the centrepiece of the book is the story of his time performing all over East Germany as the campaign for democratic socialist change grew: history observed at first hand. The support act is Newcastle-based political songsmith Uncle PAF (aka Paul Frear).